December 7, 2011 - Sikorsky Aircraft and By Kids For Kids Co., an organization that inspires kids to be successful inventors, awarded a California teenager the Igor Sikorsky Youth Innovator Award for envisioning a small unmanned helicopter that could carry critical relief supplies and electrical power to the scene of a natural disaster or other catastrophic event. 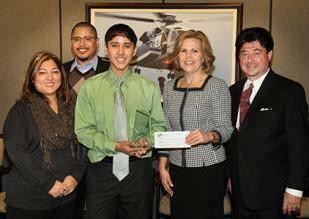 Tharon Trujillo, 15, of Plumas Lake, Californian accepted the award a trophy and a $1,000 scholarship check during a company-paid visit to Sikorsky?s headquarters in Stratford, Conn. Accompanied by his parents, he toured the assembly line of Sikorsky?s iconic Black Hawk and Seahawk military helicopters, and met with company rotorcraft designers and engineers. The Igor Sikorsky Youth Innovator Award is the grand prize of a new national competition called the Sikorsky Helicopter 2050 Challenge. Sponsored by Sikorsky and By Kids For Kids, the program challenges youths ages 9-16 across the U.S. to envision the helicopter of the future. This year?s Helicopter 2050 Challenge ran from June 1, 2011, to Sept. 15, 2011, generating entries from 243 youths. Tharon calls his winning helicopter concept the F.L.E.A. for Flying Logistics Electrical Assistance. As its name suggests, the aircraft would be small the equivalent size of a two-person helicopter but as an unmanned aircraft would have increased capacity to carry two externally mounted five-foot-tall pods containing provisions, medical supplies, power generation and communications equipment. Once released on the ground, the pods could be wheeled to specific locations. Pod-mounted cameras could stream video of survivors and damage to emergency managers, and could be used by virtual doctors to direct medical care at triage stations. A computer would enable survivors or rescuers to upload information to a database. Tharon also envisions power generation inherent to the pod design. Self charging fuel cells inside the pods doors would enable survivors and first responders to generate electricity to power lights and radios, and to recharge batteries and electronic devices, such as cell phones. The pod also would serve as part of a cellular communication network. ?I came up with the idea for F.L.E.A because there have been a lot of natural disasters happening in the world lately,? said Tharon. ?During those disasters there was little communication or electricity to help those in need. F.L.E.A. would help them to quickly get the materials and help they need to survive.? Tharon said he sees the unmanned F.L.E.A. aircraft as an autonomous vehicle monitored by an operator across a satellite data link. And like a hybrid car, the aircraft would fly using a mix of aviation fuel and electricity generated by onboard fuel cells. Four judges (two each from Sikorsky and By Kids for Kids) assessed the 15 finalists selected from the Helicopter 2050 Challenge, which was presented online, and via selected museums as a summer education program. Judges scored each entry for concept uniqueness, the fullness of the idea?s description, and creativity of presentation. ?Tharon had a complete and very well thought out entry,? said Vern Van Fleet, a mechanical engineer at Sikorsky, who helped judge the final 15. ?He was very detailed and creative in how he presented his concept with photos, sketches and ideas. His entry made you understand how the concept could be useful.? As a 10th grader at Lindhurst High School, Olivehurst, Calif., Tharon enjoys hanging out with friends, playing basketball and fishing. He would like to own a business when he is older and to be a role model for kids to follow their entrepreneurial dreams. ?Youth and technology are two of the most powerful forces changing our world,? said Judy Bankowski, Vice President and Chief Information Officer at Sikorsky. ?I am amazed by the creativeness of the entries, and excited that Sikorsky could give these kids the opportunity to think outside the box and to visualize what might actually be possible in another 40 years.? Sikorsky sponsored the Helicopter 2050 Challenge as part of its Science, Technology, Engineering, Math (STEM) program that inspires kids to become engineers. Sikorsky and By Kids For Kids are expected to repeat the Helicopter 2050 Challenge during the summer of 2012.